Pinbone’s re-entry on the Sydney dining scene last month was met with high readings of hype and anticipation – and some tokens of fortune, too. 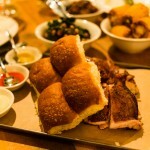 The crew’s latest pop-up, named Good Luck Pinbone, was aptly greeted with charms aplenty after launching in Kensington. A gold chicken wishbone, lucky wooden spoons carved from durian, a rusted horseshoe scavenged from out front and a lucky cat were given to head chefs Mike Eggert and Jemma Whiteman and front-of-house gun Berri Eggert. There was also a good luck suckling pig due to land on the day they opened, but they had to knock it back, given there was no room or time to cope with its arrival – the team was too busy rushing Good Luck Pinbone to the starting line. 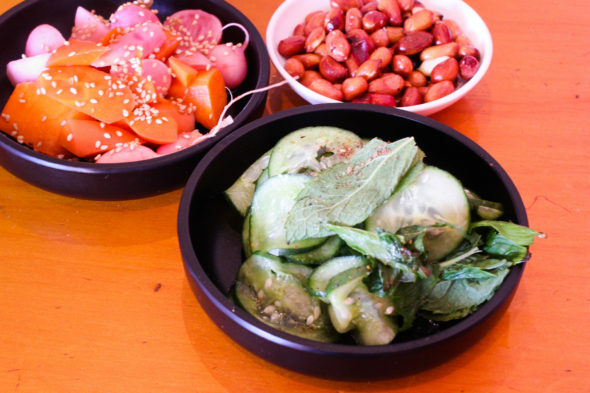 Grab Your Fork’s Helen Yee recalls Berri ripping the brown paper sheets off the windows on opening night, just before Helen and her friends made headway on a zippy trio of radish, carrot and turnip pickles ($8). Good Luck Pinbone channels the prosperity-evoking titles of Chinese restaurants and the name is more than just a gift-magnet (although, PS, if you’re a hardline well-wisher looking for ideas, no one’s turned up with a rabbit’s foot, four-leaf clover or leprechaun … Yet). 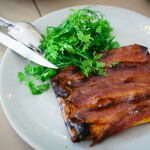 The title redirects the Pinbone crew east (and follows on from their residencies at a much-loved Italian wine bar, 10 William Street, and the OG Woollahra location, where they retooled kids’ party snacks for adult palates and remixed brunch from its dull default of avo-on-toast: Pinbone’s famous Bacon, Maple and Pumpkin Tart was a pantry-raiding accident that later became a Gourmet Traveller cover star). 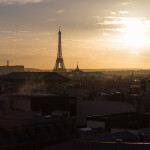 Pinbone’s team is ultra-talented (having racked up awards and guest appearances at Omnivore in Sydney, Paris and soon, Shanghai), so they really don’t need any good fortune to do well. But as you can tell from the lo-fi set-up, this place isn’t exactly powered by a blockbuster budget or schmick designer fittings. Good Luck Pinbone was launched thanks to a commando unit of relatives and hospo friends whose DIY enthusiasm made Mike, Jemma and Berri’s pop-up physically possible. “We flipped the site from basically nothing in three weeks,” says Mike, who ate Bunnings sausages 12 days in a row because he was revisiting the hardware store so much. Family members chipped in after hours, especially on unglamorous jobs (such as plumbing, which Jemma’s hero brother took care of), while industry friends contributed, too. Shannon Debreceny from LP’s Quality Meats “came by with beers to have a snoop”, says Mike. He ended up breaking and rebuilding a wok because it wouldn’t fit through the restaurant’s door. Matt Young, from Black Market Sake, dropped off gifts of high-grade soy and mirin as the Pinbone team was carpeting the restaurant – and chose to stick around. And instead of recuperating from this mammoth job of simply getting the restaurant to open, Mike and Jemma have managed to knock out an amazing menu with just two woks, a steamer and grill. Imagine how dangerous they’d be with an infusion of proper cash. So far, though, they’re doing out-of-the-ballpark great with their lo-fi surrounds and budget. They’ve got awesome skills and cred to draw from, given their time at Billy Kwong, working under Kylie Kwong and Mat Lindsay (who is now killing it at Ester). The Chongqing Crispy Spatchcock with Chilli Peanuts ($33) at Good Luck Pinbone is a throwback to a Billy Kwong dish, although made with cleaner-tasting sake instead of Chinese xiao xing cooking wine, along with other new tweaks; the Blue Swimmer Crab with White Pepper Sauce ($30) also is indebted to Mat Lindsay, but the sauce is thickened with crab roe and redone with other Pinbone updates. 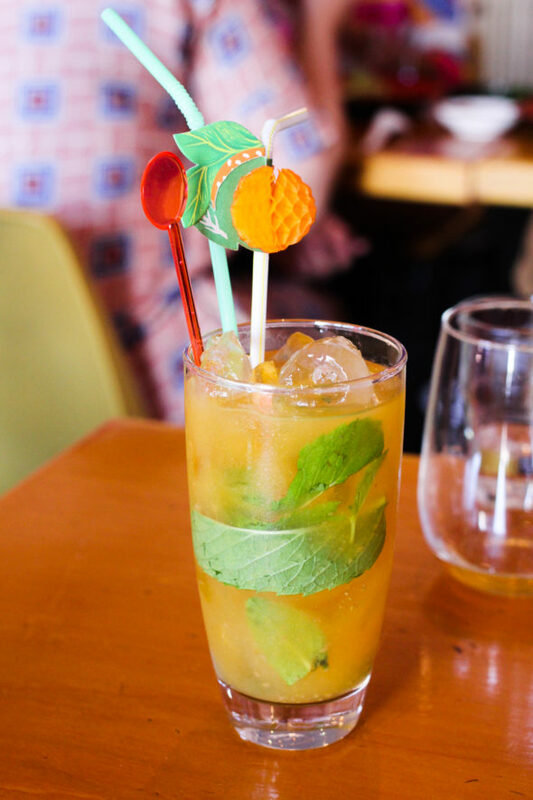 Like at Billy Kwong, the menu also interlaces native ingredients in a smart, inventive way. 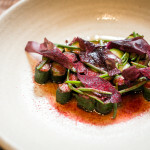 Will tries the Kangaroo Tataki, Herbs, Butter Lettuce ($18) and compares it to an Australian twist on sang choy bow. The use of wild-harvested meat reminds me of the Feral Party that Pinbone threw at Young Henrys for 2015’s Good Food Month, complete with projectile-shaped camel kofta for the poncho-messing food fight that followed. (Plus, this sustainable approach also seems in keeping with Mike’s pre-chef days as an environment science student.) You can also see a hyperlocal focus with the Mixed Greens, Macadamia Custard ($17); the custard is like a native take on silken tofu (via the peanut custard that they used to make at the OG Pinbone). It’s served with a tangle of greens (a handful of chrysanthemum, water spinach, sweet potato leaf or amaranth usually), cooked “filthy hot” on the wok and topped with smoked macadamia nuts. Mike says they’re like “cheese and bacon balls” for vegos and vegans. Like at Pinbone 1.0, the latest pop-up is really great with handling dietary requirements. And the vego-friendly options are fantastic – particularly the Eggplant Sambal, Black Fungus, Coriander ($18), which is such a standout that carnivore friends have name-checked it as their menu pick. The diced eggplant is so gloriously fried and rich, it’s almost like caramel you’d want to bottle; the dish is also flashed through with sake, white soy, white pepper, dark-roasted sesame oil and house-made chilli sauce, so it’s ringing with flavour. 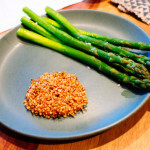 When I interviewed Mike on my podcast, he said that he and Jemma were “white pepper chefs” and you can see how thoroughly they mark their allegiance to this seasoning – its ultra-layered bite really gives dishes a lightning charge. 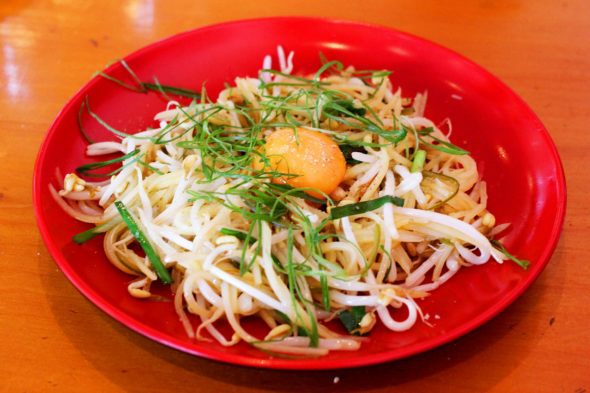 White pepper is dusted through many dishes, especially the brilliant Stir-Fried Potato, Bean Sprouts and Raw Yolk ($15). Wok-fried potato shreds and sprouts are hit with so many flavour points – pickled green chilli, a pinch of sugar, garlic chives, sake and shoyu, potato skin stock, a bit of garlic puree, a LOT of white pepper – and then branded with the bullseye of a perfect egg yolk. There’s great joy in jostling that runny egg through everything and airlifting the ultra-savoury mess into your mouth. In her Good Food review, Myffy Rigby singled this out as her go-to dish. 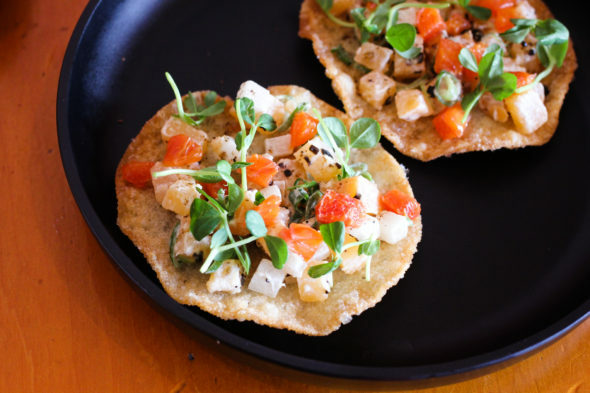 When I’ve dined there, Good Luck Pinbone has also kindly custom-fit some of its dishes – the Crisp Wonton Skin with Sashimi, Swede, Nashi Pear ($4.50 each), or Fried Rice with Pork Jowl and Green Garlic ($16) for instance – into vegetarian versions that are stand-alone great. In fact, even a meathead like Will likes the vego version of the fried rice so much that he may retract his loyalty to any other versions he’s ever tried in his life. (Also, when we are so beyond capacity that shovelling in any more food seems like an impossible physical act, we still are able to keep clearing that bowl of shiitake-egg-and-fried-shallot-loaded grains.) Should you want to try the standard pork jowl version, though, it is impressively made. It’s created with pork fat trim from Haverick Meats, cured in a ham-like brine for four days, then cold-smoked. When jumbled through the fried rice with eggs and garlic stems, Mike says it’s like “a bacon egg roll with aioli, but in rice”. If you are a meat eater, one unmissable dish is the Sirloin, Furikake Butter, Mustard Greens ($31). We saw our friends Levins and Marc demolish the entire Good Luck Pinbone menu in one sitting (their order redundantly named a few dishes and then ended with “and anything else” – basically, authorisation for the chefs to crush them thoroughly, which they did) and their rave reviews of the restaurant were headlined by this particular number. Grass-fed black Angus steak is grilled over charcoal and is taken to the next level, thanks to a brown butter that’s peppered through with furikake (and not just any store-bought jar of the Japanese seasoning, either, but a shake-ready mix that Jemma has created with black and white toasted sesame, kelp, kombu, nori, dried sea lettuce and flakes of bonito and mackerel). Wok-fried mustard greens may be there on the plate as a defence against cardiac arrest, possibly. After Will demolished his serve – at the end of our hefty second visit to Good Luck Pinbone – he declared, “I have a food baby. And its name is Steaky McTofu Greens”. 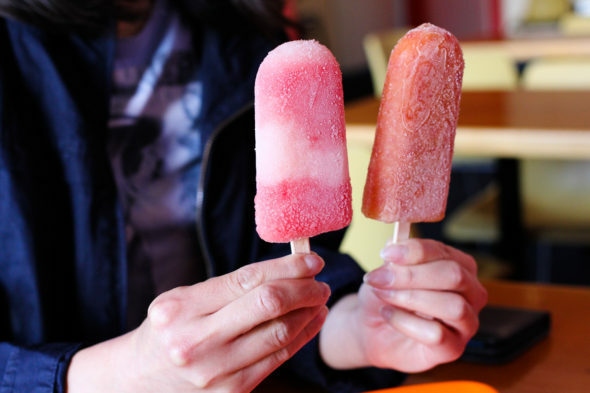 And, because Good Luck Pinbone is unlicensed, the pops also pair nicely with in-house drinks, which include beverages like Strawberry and Apple Iced Tea ($6), Lychee, Mango and Lime Soda ($6), Persimmon and Blueberry Soda ($6). 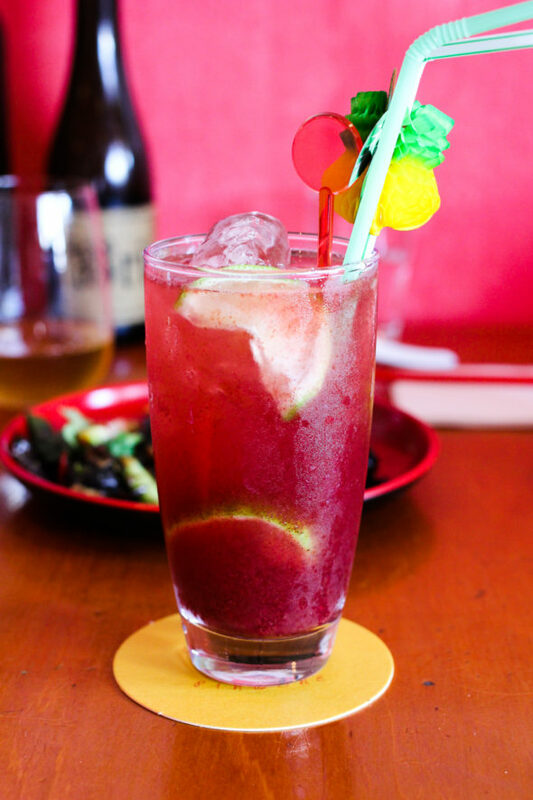 BYO is $5 if you feel like bringing some bottles of Brian or sake. While some places have billed Good Luck Pinbone as a “Chinese restaurant”, it isn’t strictly so, and it’s not trying to be. 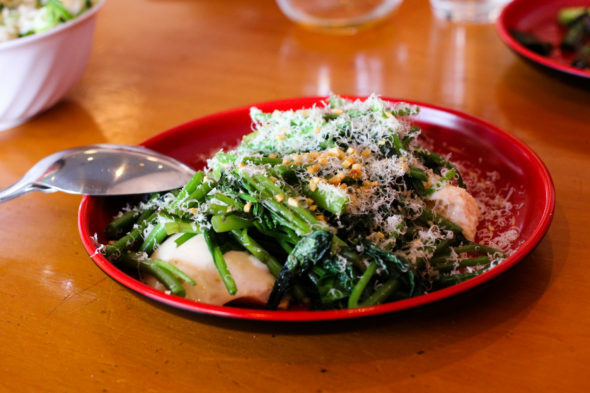 The influence is split between Chinese, Japanese and a little Korean cuisine – cross-breed it with the native Australian element and the wildcard Pinbone factor, and the result is unlike anything else around. I love the fact they are taking this one-of-a-kind brand of Asian food to Omnivore in Shanghai in 2017, too. Good Luck Pinbone’s unique and flavour-charged coverage of so many borderlines seems like the perfect representation of Australian food. An upside of the team’s trip to Omnivore – they’re working through the Christmas to New Year’s period, so you can catch them during their usual Thursday to Sunday hours, with a special January 1 recovery brunch that’s bookings-only – this one-off event revives Pinbone brunch favourites as well as dumplings, noodles and other “rejuvenating foods” to go with your New Year’s hangover. (Try your luck at info@pinbone.com.au to see if there are any seats left at all). Aside from that particular public holiday, Sunday lunch is usually an excellent time to head to Good Luck Pinbone. There’s typically a strong circulation of hospo folks – and good vibes. Plus, a lazy Sunday where you don’t have to keep an eye on the time and can effortlessly rack up multiple dishes among friends is a prescription for well-spent hours. I’m hoping they end up running the full length of their lease. (Should I hoard some good luck charms to make it true?!) Regardless of this pop-up’s lifespan, the emergence of this restaurant is Sydney’s good fortune. Make the most of it while you can. Good Luck Pinbone, 121 Anzac Parade, Kensington, www.pinbone.com.au. Follow Pinbone on Facebook, Twitter and Instagram.